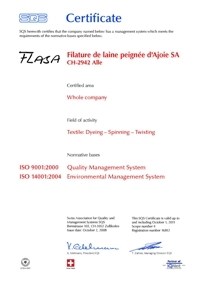 In respect with the company policy, Flasa obtained ISO 9001 and 14001 certification for the glabality of its activities, dyeing, spinning and twisting. 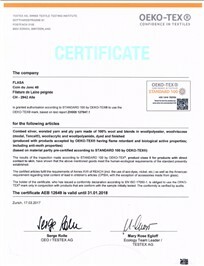 Our products also meet Öko-Tex Standard 100.A new production process can only be accepted if it has no negative impact on the eco-system. An other demonstration of this will is the use of eco-electricity. 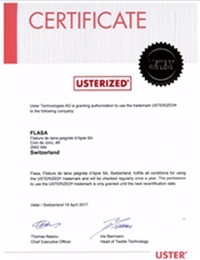 FLASA is the first long staples spinner to become USTERIZED®. This indicate FLASA's commitment to produce quality yarns. FLASA has implemented USTER® equipment and the relevant control procedure to maintain its products quality up to the highest standards.